In general, I am really bad at anniversaries. It’s not that I forget the dates, I’m just not organised enough to have the gift, the card and the wrapping paper ready at the same time to give on the correct day. Many times I have had to say to my wonderful, patient husband that I have a really awesome anniversary gift for him but I’m still waiting for it to arrive in the mail! The anniversary for my blog has been much like this. The official anniversary date was months ago and even though I had the recipe sorted out earlier in the year and the cake photographed weeks ago I’m only now posting it. I have about nine months to work on the next blogiversary post so maybe I should start now! This cake is deliciously moist, sweet and the perfect showcase for apples. 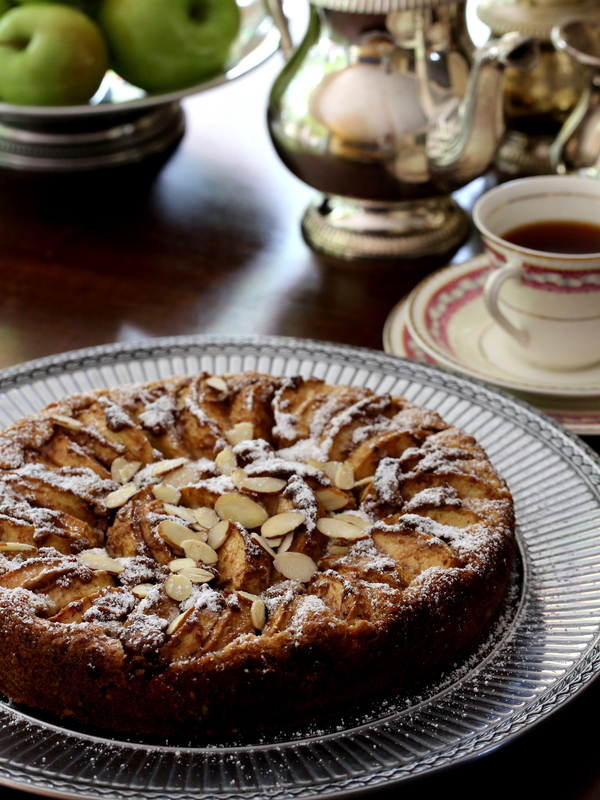 I’ve always had a soft spot for apple cakes. For Year 8 Home Economics I baked an apple tea cake; such a simple cake but it looked so pretty! I was so especially proud of it that after school I took a photo of it, even going to the effort of styling it with a teacup and teapot, with a film camera. The photo was disappointingly terrible of course; all of my photos were then. I would never had imagined at the time that I would have a dessert blog. No one could have imagined it because of course the internet didn’t exist then. The last year (or so) of blogging has been great. I have developed some new skills, got out of my baking rut and my photography has improved vastly. I’m looking forward to seeing how much further I can improve over the next year. Thank you readers very much for taking the time to read my blog and for your generous comments! I hope you bake the cake and enjoy it! Preheat the oven to 180C. Line the base of a 20cm (9inch) springform tin. Mix together the almonds, sugar, flour, baking powder and cinnamon in a large bowl. In a separate bowl or jug mix together the oil, apple sauce and vinegar. Add the wet ingredients into the dry and gently fold until combined. Pour the batter in the cake tin. Prepare the topping by mixing together the vinegar, cinnamon, sugar and almond butter in a large bowl. Add the apple slices and toss until they are well coated. Arrange the apple slices on top of the cake batter. Any leftover almond butter mix may be spread on top. Bake for approx 35 minutes. Allow to cool in the tin for at least 15 minutes before releasing. 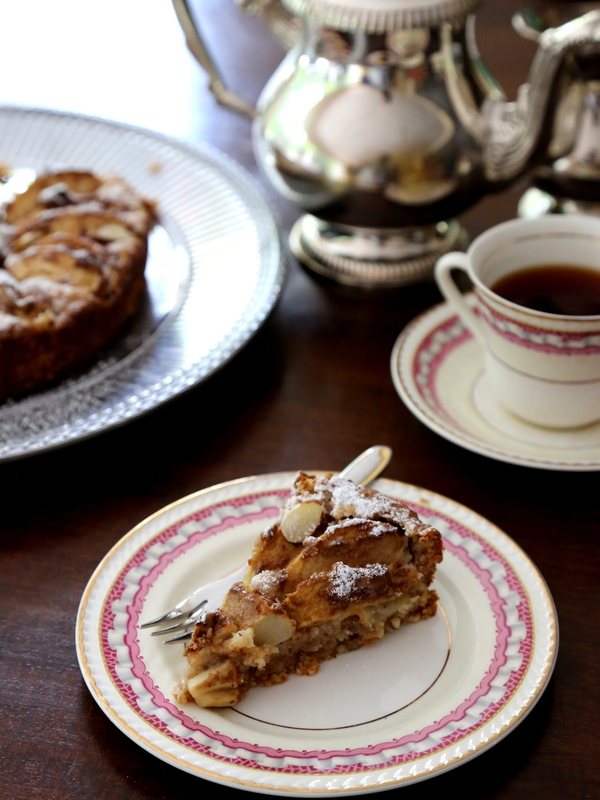 To serve, dust with icing sugar and garnish with flaked almonds. Posted in Cakes & MuffinsTagged apple, blogiversary, cinnamon, dairy free, egg free, food, food photography, vegan, vegetarianBookmark the permalink. Happy belated blogiversary. I love desserts with apples, so I love this cake. Best wishes in the years to come. your bake and photography are gorgeous. This looks delicious. Do you think I can substitute Honeycrisp apples for the Granny Smiths? Thanks so much Beth! I have never heard of Honeycrisp apples! Granny Smith apples are the usual cooking apple in Australia. They have green skin (although that is not important in this recipe), are slightly tart and hold their shape well when cooked. Does this sound similar to a Honeycrisp? Congratulations on your blogiversary! I love apple cakes. 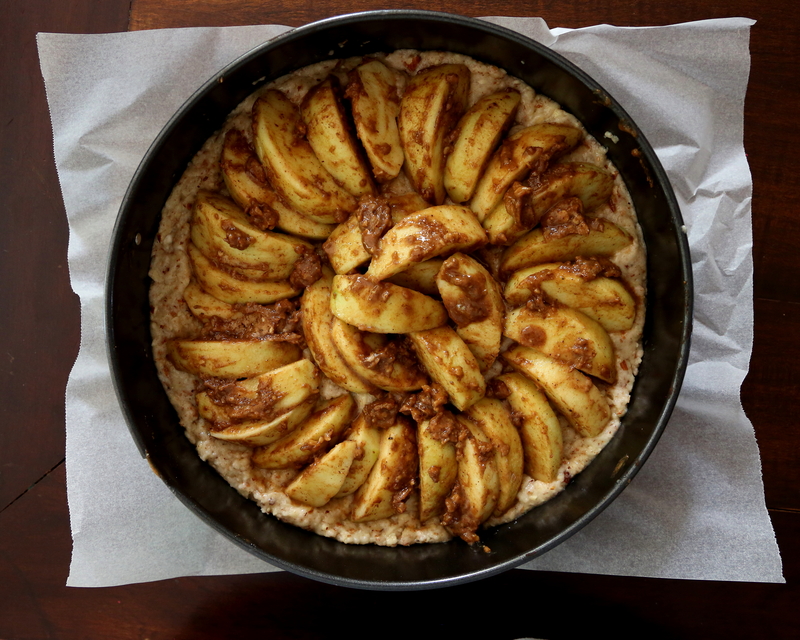 This reminds me of my mother-in-law’s Italian apple cake. This cake looks delicious. I love the look of you cake and how you arranged it on the table.